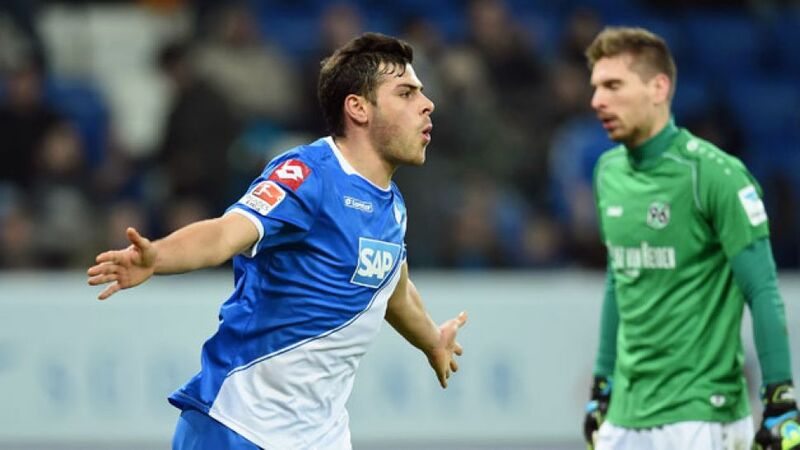 If the past six years are anything to go by, the only way is up for 1899 Hoffenheim striker Kevin Volland. From his humble Bavarian beginnings to his current Sinsheim station, the Marktoberdorf native has struck quite the chord with Bundesliga enthusiasts the world over. Having started out at local sides FC Memmingen and TSG Thannhasen, Volland joined TSV 1860 Munich as a 15-year old in 2007. The young striker settled quickly in the Bavarian capital, scoring four goals in five outings for the reserves, as well as 12 in 22 appearances for the Germany Under-17s, 18s and 19s. Volland swiftly made the leap to the 1860 first team, making his Bundesliga 2 bow in a goalless draw away to Rot-Weiß Oberhausen in October 2010. Six goals in his debut season preceded a further 14 in 2011/12 and, in the summer of 2012, he finally completed a high-profile move to Bundesliga outfit Hoffenheim, having agreed a transfer to die Kraichgauer in January 2011. On target six times in 31 Bundesliga appearances in 2012/13, Volland was one of the few positives to emerge from a turbulent debut campaign that spelled the end of the managerial road for Markus Babbel and Marco Kurz, before Markus Gisdol came in to salvage 1899's top-flight status by way of the play-offs. The Gisdol era now in full swing, Hoffenheim appear to have turned a corner, with Volland an integral cog in the Sinsheim-sourced goal machine, finding the net on ten occasions and providing a further five assists, during the 2013/14 campaign. Away from the domestic circuit, Volland has similarly gone from strength to strength, establishing himself as head coach Horst Hrubesch's in the 2015 UEFA European U21 qualifying campaign. However, with Joachim Low seemingly short of attacking options in the run-up to the 2014 FIFA World Cup in Brazil, the U21 captain was handed a chance to make his bow with the senior team making Germany's provisional 30-man squad in May. Volland credits his strength and low-centre of gravity, two of his most impressive attributes, to his exposure to ice hockey as a youngster. Having already demonstarted leadership qualities both on the domestic and international front, big things can be expected of Hoffenheim's inherently gifted frontman.